noble birth: blue blood is no guarantee of any particular merit, competence, or expertise. • (also blueblood) a person of noble birth: a comforting figure among that crowd of blue bloods. Description: "Blue Blood" is a response and visual account of current issues of environmental fragility and cultural sustainability pertaining to climate change and economic viability. 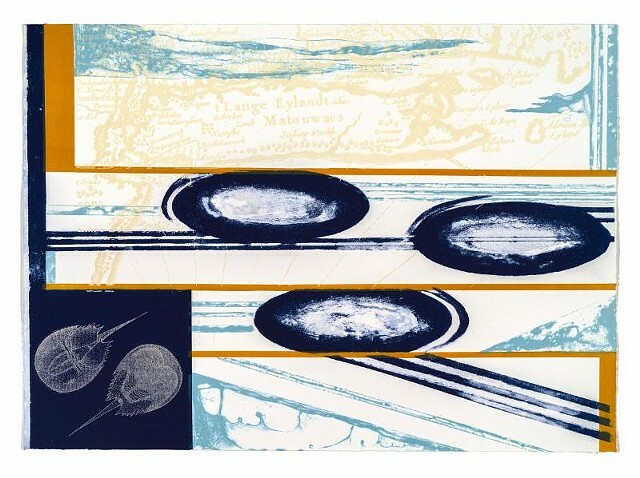 The composition is a reflection of nautical flags, charting, and the physical paper is etched with the image of an antique map of Long Island, New York. As a child, I grew up walking the shore line to witness the early summer season spawning and shell shedding of the Horseshoe Crabs. This memory is visually striking as both a marker of one of the oldest creatures on earth and, as I grew older and saw fewer along the shores, of their potential decline and extinction. It has been well published in the past few decades of the use of their blood, the color of which is blue within the pharmaceutical industry as an antigen. Previous to this economical use, Horseshoe crabs have been used by bay men outside of the Shinnecock Community in the fertilizer industry and as bait for the growing eel market overseas. Our nation and people struggle for economic survival and the dichotomy of our traditional lands is one that is surrounded by wealth: "The Hamptons". As our local environmental resources decline due to nitrogen run-offs and over harvesting, the response that I have is to create a visual record and marker of this period. The ellipses reference blood cells as well as a visual abstraction of the aerial view one sees of the whale pods that pass by Long Island on their migration path. The invitation to create a work for the Art In Embassies project was completely open for the artists to respond and contribute. Ultimately this questions lingers in my practice: Can a culture sustain itself when it no longer has access to the environment that fashions that culture?